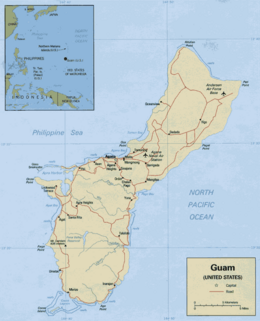 Guam (Chamorro: Guåhån), officially the U.S. Territory of Guam, is an island in the Western Pacific Ocean and is an organized unincorporated territory of the United States. Its indigenous people are the Chamorros, who first populated the island approximately 4,000 years ago. It is the largest and southernmost of the Mariana Islands. Guam provided one take-off point for the bombing of Hiroshima, which brought about the defeat of Japan in the World War II. Guam's five U.S. military installations, among the most strategically vital in the Pacific Ocean, take up one quarter of the territory's area. Guam, the largest island in Micronesia, is 1,500 miles (2414 km) southeast of Tokyo and 6,000 miles (9656 km) west of San Francisco, and has an area of 210 square miles (544 sq km). The northern part of the island is a forested coralline limestone plateau while the south contains volcanic peaks covered in forest and grassland. A coral reef surrounds most of the island, except in areas where bays exist that provide access to small rivers and streams. The island's population is most dense in the northern and central regions. The capital is Hagåtña, formerly Agana (pronounced Agaña). The Mariana island chain was created as a result of the Pacific and Philippine tectonic plates colliding. The Marianas Trench lies to the east of the island chain. The Challenger Deep, the deepest point on earth, is southwest of Guam at 35,797 feet (10,911 m) deep. The island sustains occasional earthquakes due to its location on the edge of the Pacific Plate. Unlike the Anatahan volcano in the Northern Mariana Islands, Guam is not volcanically active. Guam has a tropical marine climate. The weather is generally warm and humid with little seasonal temperature variation. The mean high temperature is 86° Fahrenheit (30°Celsius) and the mean low is 76°F (24°C) with an average annual rainfall of 86 inches (2,180 mm). The dry season runs from December through June. The highest risk of typhoons is during October and November. After Super Typhoon Pamela in 1976, concrete structures started replace the more traditional wooden buildings. Guam's indigenous ecology has been largely destroyed and supplanted by introduced species. The slightly venomous but rather harmless brown tree snake (Boiga irregularis), thought to be a stowaway on a US military transport during World War II, has killed a large percentage of the native bird population on the previously snake-free island. These snakes, that have no natural predators on the island, were blamed for frequent blackouts in the 1980s by shorting out powerlines and transformers. 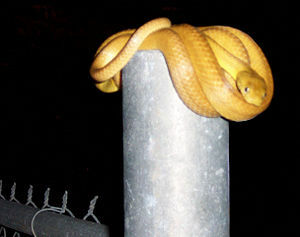 Many power poles now have a slick metal sheath to prevent the snakes from climbing. Wild fires have devastated large areas of forest. Poachers often start fires so deer would be attracted to the new growth. Invasive grass species that rely on fire as part of their natural life cycle grow in many regularly burned areas. As a result, grasslands and barren areas have replaced previously forested areas, leading to greater soil erosion. which leads to water quality problems for southern Guam, and destruction of marine life in reefs around the island. Guam was first discovered by sea-faring people who migrated from Indonesia or the Philippines around 2000 B.C.E., according to legends and myths, archaeological evidence, Jesuit missionary accounts, and observations from visiting scientists. The first European to discover the Mariana Island group was Ferdinand Magellan who, on March 6, 1521, observed the two southernmost islands and sailed between them. Magellan's crew called the islands “Islas de los Ladrones” (The Island of Thieves). The common account for this naming resulted from the theft of a boat from Magellan's ship, which may, in fact, have stemmed from cultural differences around private property. General Miguel López de Legazpi claimed Guam for Spain in 1565. Spanish colonization commenced in 1668 with the arrival of Padre San Vitores, who established the first Catholic mission. Guam, along with the rest of the Mariana and Caroline Islands, were then governed as part of the Spanish East Indies from the Philippines. 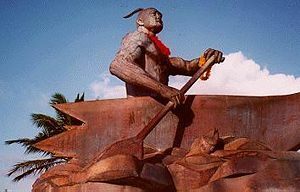 Between 1668 and 1815, Guam was an important resting stop on the Spanish trade route between Mexico and the Philippines. The original population of Guam declined significantly as a result of disease and rebellion against the Spaniards. Much of the adult male population was killed. In 1668, the Chamorros, who were typical Micronesians, with a considerable civilization, were estimated at 40,000 to 60,000; less than a century later, only 1,800 remained. On June 21, 1898, Guam was captured by the United States in a bloodless invasion during the Spanish-American War. By the Treaty of Paris (1898), Spain officially ceded Guam to the United States. Since then, Guam served as a way-station for American ships traveling to and from the Philippines. The northern Mariana Islands passed to Germany, then Japan. During World War II, Japanese armed forces invaded Guam on December 8, 1941. Chamorros from the Northern Mariana Islands were brought to Guam to serve as interpreters and in other capacities for the occupying Japanese force. The Guamanian Chamorros were treated as a conquered enemy. They were subjected to forced labor, family separation, prostitution, incarceration, execution, and concentration camps. Guamanian Chamorros came to resent the Chamorros in the Northern Marianas. To this day, Guam remains the only US soil, with a sizeable population, that suffered under foreign military power occupation. 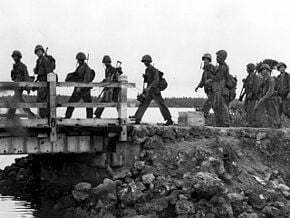 Marines cross a bridge in Agat, Guam during the liberation of Guam in 1944. Guam's occupation lasted for approximately 31 months. The United States returned and fought the Battle of Guam on July 21, 1944, to reclaim the island. The US also captured and occupied the Northern Marianas. Guam and Saipan provided the take-off point for the bombing of Hiroshima. When the armistice was signed, the war ended for everyone except one Japanese soldier who continued hiding out in Guam until 1990. His family thought that he had been killed in action. The US Navy attempted to resume its dominance in Guam's internal affairs in the years immediately following World War II. This increased political pressure from Chamorro leaders for greater autonomy. The result was the Guam Organic Act of 1950, which established Guam as an unincorporated organized territory of the United States and, for the first time in Guam's history, provided for a civilian government, and granted the people United States citizenship. On September 11, 1968, the Elective Governor Act (Public Law 90-497), allowed the people of Guam to elect their own governor and lieutenant governor. Nearly four years later, Congress passed the "Guam – Virgin Islands Delegate" Act that allowed for one non-voting Guam delegate in the House of Representatives. In the meantime, Guam's local government had formed several commissions to address options for self-determination. Guam is governed by a popularly elected governor and a unicameral 15 member legislature. Guam elects one non-voting delegate to the US House of Representatives. Citizens of Guam, as with those of other unincorporated territories, do not vote for US Presidents. In the 1980s and early 1990s, there was a significant movement in favor of the territory becoming a commonwealth, which would give it a political status similar to Puerto Rico and the Northern Mariana Islands. In Guam's first political status referendum in 1982, 49 percent of Guam residents who voted chose a closer relationship with the United States via Commonwealth, 26 percent voted for statehood, while ten percent voted for the status quo. 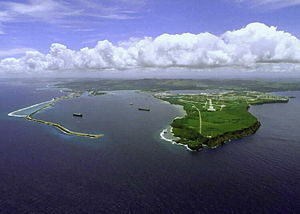 In 1988, the first Guam Commonwealth Act was introduced in Congress. Delegates have subsequently reintroduced the bill with little success. Other groups advocate political independence from the United States, statehood, or a combination with the Northern Mariana Islands as a single commonwealth. Opponents say Guam does not have the financial resources to warrant such status. 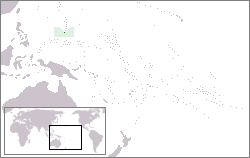 Guam is divided into nineteen villages. The US military maintains jurisdiction over installations representing approximately one quarter of the island's area: Andersen Air Force Base, Yigo; Naval Air Station, Tiyan; Guam Naval Station, Orote peninsula; Ordnance Annex, South Central Highlands; and Naval Communications Station, Barrigada, and Finegayan. The economy depends largely on US military spending and tourism. Total US grants, wage payments, and procurement outlays amounted to US$1.3 billion in 2004. The Guam Treasury, rather than the US Treasury, receives federal income taxes paid by military and civilian Federal employees stationed in Guam. Over the past 30 years, the tourism industry has grown to become the largest income source following national defense. Sometimes called "America in Asia," Guam is a popular destination for Japanese (90 percent), Korean, and Chinese tourists. With over 20 large hotels, a DFS Galleria, Pleasure Island aquarium, SandCastle Las Vegas shows, and other shopping and entertainment features in its chief tourism city of Tumon, the island's economy has grown dramatically. It is a relatively short flight from Asia compared to Hawaii, and a series of hotels and golf courses were built to cater to tourists. Significant sources of revenue include duty-free designer shopping outlets, and the American-style malls: Micronesia Mall, Guam Premium Outlets, and the Agana Shopping Center, and various businesses catering to tourists in Tumon. Guam has a 14 percent unemployment rate, and the government sustained a US$314 million shortfall in 2003. Per capita gross domestic product was US$15,000 in 2005. Exports totaled US$45 million in 2004. Export commodities were mostly trans-shipments of refined petroleum products, construction materials, fish, and food and beverage products. Export partners were Japan (67.2 percent), Singapore (11.6 percent), and the United Kingdom (4.8 percent). Imports totaled US$701 million. Import commodities were petroleum and petroleum products, food, and manufactured goods. Import partners were Singapore (50 percent), South Korea (21.4 percent), Japan (14 percent), and Hong Kong (4.6 percent). Most of the island has mobile phone service, and high speed internet is now widely available through cable or DSL. Most residents use cell phones. The telephone service is extremely reliable, as compared to 20 – 25 years ago when phone outages were common. Guam was added to the North American Numbering Plan in 1997, decreasing the high costs of international long-distance calls to the mainland. As Guam is also part of the US Postal System, mail to Guam from the mainland is considered domestic and no additional charges are required. Private shipping companies such as United Parcel Service, DHL, or FedEx also regard Guam is domestic, although this is often not reflected in the shipping charges for many mail-order companies or websites. Guam is served by the Antonio B. Won Pat International Airport. There are no direct flights to Guam from the U.S. Mainland. Flights to Guam go through Hawaii, Japan, or Korea first and generally require a layover and a plane transfer. Most residents of Guam own cars. A limited bus system exists but is not used by many. The population of Guam reached over 150,000 by 2000, representing more than a six-fold increase since 1940, largely as a result of immigration after 1965. The largest immigrant population derives from the Philippines, followed by American military personnel and other Asian immigrants. Guam has a long life expectancy, 78.58 years for the total population. The largest ethnic group are the native Chamorros, accounting for 37.3 percent of the total population. Other significant ethnic groups include those of Filipino (29.3 percent), White (7.1 percent), and Chuukese (7 percent) ethnicities. The rest are from other Pacific Islands or of Asian ancestry. The official languages of the island are English and Chamorro. The Chamorro language, which is spoken throughout the Mariana Islands, is an Austronesian language. While 85 percent of the population are baptized into the Roman Catholic faith, or belong to another Christian denomination, animistic beliefs persist, including a respect for ancestral spirits, or “taotaomo'na,” who are believed to occupy certain trees and other areas in the forests. Indigenous Chamorros believe their ancestors have lived in the Mariana Islands since the dawn of time, that the Mariana Islands are center of the universe, and that all human life began in Guam. While Spanish Catholic missionaries abolished the practices of the “makahna,” who mediated between the spiritual and physical world, many of them persist. Persons' spirits are widely believed to live beyond their physical life. Every year on All Soul's Day, Chamorros remember their ancestors by holding memorial services and decorating graves with flowers, candles, photographs, and other mementos. The extended family, or clan, is the core of society. This can include grandparents, parents, children, grandchildren, cousins, and other relatives. Adoption is common. This enables childless women to raise a niece or nephew. Grandparents may exercise parental control over a grandchild. The groom's family sponsors any marriage, provides the bride with her wedding dress, and throws a party to show they can provide for their new daughter. Upon marriage, the woman was expected to relocate to her husband's clan land, although many live in whatever housing is available. Chamorro society emphasizes respect for the elderly. There is a practice of sniffing the right hand of an elderly person to express one's deep regard. Clan elders held power and authority before colonial rule. There are two classes: the “manakhilo” (high people) and “manakpapa” (“low people”). The former includes wealthy families from the capital of Hagåtñta who have held positions of power since the colonial era. Most clans have members in both social classes. The rich and the poor live side by side within family compounds in rural villages. A symbol of Chamorro strength, pride, resistance, and survival, is the latte stone, a megalithic structure used to elevate houses in the pre-colonial period. First built around 800 C.E., latte stones are large coral blocks composed of a trapezoidal stone pillar called a “haligi,” and a hemispherical cap called a “tasa.” Construction of these stones ceased after the onset of wars against Spanish colonizers. Jungle areas and sites in which latte stones are located are considered sacred. In precolonial years, people buried family members beneath latte stones and thus ancestral spirits are assumed to reside there. In Chamorro culture, the sharing of food is part of a system of give and take reflecting a sense of obligation between people. Daily foods include rice, fish, breadfruit, and taro, in addition to imported canned goods, and fresh and frozen meats and vegetables. Each village celebrates the feast day of its patron saint. These feasts draw large crowds, and large quantities of food are prepared. Literacy on Guam is high. Ninety-nine percent of people age 15 and over can read and write. In 2000, a total of 32,000 students attended Guam's public school system, however the public school system has been criticized for poor management and inadequate facilities. Lack of funding and corruption are often cited as the causes. Private schools had a total attendance of 6,000 in 2000, though attendance had increased before then. In 1998, the US Department of Defense opened schools for children of American military personnel. These schools had an attendance of 2,500 in 2000. The University of Guam and Guam Community College offer opportunities for higher education. As a culture rooted in oral traditions, Guam has little written literature. A few Chamorro novels have been published. A literary journal published by the university's literature faculty motivates poets and other creative writers. There is a growing community of local painters and woodcarvers. The University of Guam's Fine Arts Theater, Southern High School's Performance Center, and the Tiyan Theater are popular venues for locally written and produced plays and musical performances. ↑ 1.0 1.1 1.2 1.3 1.4 Central Intelligence Agency, Guam The World Factbook. Retrieved July 20, 2017. Andersen Air Force Base Guam Andersen Air Force Base. Guam Countries and Their Cultures. Northern Mariana Islands Countries and Their Cultures. Challenger Deep - Marianas Trench Extreme Science. Map of Micronesia Map South Pacific. Guam Maps Perry-Castañeda Library Map Collection at the University of Texas at Austin. Hafa Adai and Welcome to Guam! Guam-OnLine.Com. This page was last modified on 24 August 2017, at 15:29.